It's basically a thick rich square of chocolate, like a piece of smooth rich fudge and after playing around with several different kinds of recipes...I have found my favorite. I love the plain chocolate, but you can change it up by adding different flavorings such as hazelnut, mint, or irish cream. However you like your hot cocoa...there is a Hot Cocoa on a Stick for you! Heat the cream and sweetened condensed milk in a pan over medium heat stirring occasionally until it begins steaming. Remove from heat and add the chocolate. Stir and let sit for 10 minutes, then place back on the medium to low heat and whisk until the chocolate is completely smooth and silky. Add flavoring of your choice. Pour chocolate into parchment lined pan. Spread as level as possible and let sit for 10 to 12 hours. Remove chocolate from pan and place upside down on a cutting board. Using a long thin knife cut the chocolate blocks into 1" square pieces. Tip - Heat the knife in hot water and dry before every few cuts to get a smooth line. To finish off your Hot Cocoa on a Stick, add marshmallows, Swedish pearl sugar, crushed peppermints, candies or any other treat you like in your cocoa. Add a stick or wooden spoon to the top and dust the bottom of each piece with a little cocoa powder. I like to place the squares in mini-cupcake wrappers to keep them protected. These Hot Cocoa on a Stick squares make great gifts too. Just wrap them in cellophane bags and tie off with a ribbon and they are ready to go. This recipe makes 36 squares. To use your hot cocoa on a stick, heat warm milk and cream at a ratio of 3 to 1 and stir until melted! One stick will be good for 6 to 8 ounces of hot cocoa. You can make these treats ahead of time and refrigerate for up to two weeks. To top off the perfect cup of cocoa you have to have whipped cream and marshmallows and why settle for store bought marshmallows when you can make your own. 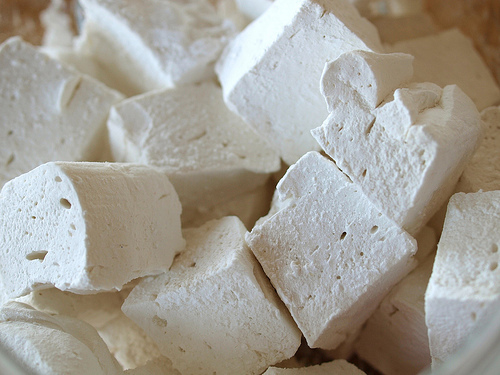 There are a lot of things I skimp on but homemade marshmallows are too easy and yummy...and fun to make with kids. I am sharing the Barefoot Contessa Homemade Marshmallows recipe. I promise they are worth it! May your holiday be cups be overflowing with chocolate cheer!!! At Christmas time I love my home to be filled with lots of Christmas trees and one of my favorites are the simple Swedish Trees. If you're lucky enough to find them this time of year...let's just say they cost more than they should. I found an easy and inexpensive way to make your own little forest of Christmas trees...and it is a fun family project too. I found the materials for this project in my canning cupboard and at my local Hobby Lobby. 2. Cut your wood dowels into 8 to 10" pieces. Run one end through a pencil sharpener to make a point for the top of the tree. Stain dowels with your favorite stain color. I used weathered oak for mine. Let dry. 3. Take the center of a piece of the Make It Christmas tree branches and wrap around the tree twice. Straighten out flat. Repeat five times up the trunk. 4. Use your wire snips to trim the ends of the trees. Go from large at the bottom to small at the top. Straighten your branches again. 5. Push your trunk straight into the Styrofoam piece so the trunk stands tall. Pull out and squirt a bit of hot glue into the hole and push the trunk back into the hole. Hold in place until cool and firm. 6. Fill your jelly cups with the Make It Christmas snowballs and your Swedish Trees are done! I LOVE these little trees. I placed two of these in each window of my house along with our Light of Christ candles. They look so traditional and give a little Christmas cheer to a usually un-decorated place in my house. I'm making a few more this weekend to give to friends and family. These little ornaments may just be my favorite addition to our big family tree this year! I'm calling them Chalk Art Christmas Hoops and they are so simple and easy to make you could get your little elves involved too. To make these Chalk Art Christmas Hoops you stretch the black fabric into the wooden embroidery hoops tight! You will want it tight because as you write with the marker, it will stretch and loosen the fabric. The tighter the better. The next step is where the magic happens. Find a design you want to put on your ornament and using the DecoFabric Pearl White marker, draw your design on the fabric. You may need to trace it more than once to get a good "chalk line" on the fabric background. Let it dry for a few minutes. My tip after making a few of these is to keep your design simple. They show best the more simple they are. Once your design is dry and finished glue your trim around the outside rim of the wood embroidery frame. Tie a ribbon around the top screw piece and hang from the tree using a ornament hanger slipped into the opening where the screw is located. I love making these ornaments because they have the look of chalk, there is no sewing involved, and it gives your tree high impact without a lot of time! I hope you enjoy making these as much as I did!!! For this DIY project you will need wood slices or slabs. I found mine at my local Michael's and Joann's Fabric Store. They cost approximately $1.50 a piece. You will also need Matte Gel Medium, Sparkle Modge Podge, White Acrylic Paint, Brushes, Damp Rag, Pencil, Scissors, Ribbon, Copy Paper, and an Ink Jet Printer. Find a photo you love. You will want one with a lot of contrast. You can use either color or black and white. I recommend sharpening the colors so there is good contrast when the ink is settled into the wood. Also, if there is any lettering or numbers in the pictures, you will want to use a photo editing program to reverse the image. Print off your image on light weight copy paper. Once your image is printed off on the light weight paper. Take your wood piece and trace around the image to get the sizing right. Cut just inside the traced line to give you a margin for the bark edge to show. Using the white acrylic paint, dry brush the surface you will be applying the image to. This helps make the image pop. You can skip this step if you want more of a shadow look to your finished project. Once the paint is dried, the magic can begin. Using a dry brush coat the wood slice surface with Matte Gel Medium. This is the product that takes your inked image and "soaks" it into the wood. When the surface is coated, place the image face side down onto the surface and smooth out. This will need to dry for 8 to 10 hours. Now that your medium is dried, you will be removing the paper fibers from the image. To do this, lightly mist the paper with water and using a damp rag, lightly rub off the paper. You will see the image appear from under the fibers. This is a delicate process. If you feel too much of the image is coming off, you can use your fingers to release the fibers. It may take a few mistings to get the fibers off, be patient and rub lightly. Once the fibers are removed, you are ready to seal the image. I use Modge Podge and because these are holiday ornaments, I used the Sparkle Modge Podge. It just give a super fine sparkle to the project which looks spectacular when the tree lights hot it. If you have any spots where the image rubbed off too much, just add a little more Sparkle Modge Podge to give it a snowy look. To finish the ornaments, drill a hole in the top of the wood slice and hang from your favorite ribbon. Tuck larger slices into blank spaces on your tree or nestle into your garlands. I use this technique for the art images I sell at Sundance. They look so antique and unique whether you use color or black and white. I think my next project will be taking images of vintage Christmas Santas and making them into a colorful set of ornaments for my kitchen tree. You can see a tutorial on this project on KUTV's Fresh Living today at 3:30! I was so naughty this year and started "decking my halls" the week before Thanksgiving! I have never done that in the past, but this year we have a super busy December with work, family in town, and lots of concerts and parties. I'm so happy to have it all done and ready to enjoy. This year there are a few new additions to our living room. I love the rich colors and textures of wood and wool and really had fun adding those touches to our tree. I'll be sharing instructions for a few of the handmade ornaments and the wool snow drift garland in the next week. My favorite and heart warming addition is the handmade stable my husband surprised me with. Last summer we went back to our family farm in New York and he brought home a few large sticks unbeknownst to me! He used the sticks from our family woods to make a stable for my nativity. It melted my heart!!! It is for sure my favorite addition this year. On the mantle there I added a wool snow-drift blanket to keep the wool going all through the room. Nestled into pine is my Grandmother red cardinal. She loved those red birds so much. I think she would be happy to see it on our Christmas mantel. I collect old Santa mugs and this was a special gift from my boys...it is by far the most unique Santa set I've seen...and I love it on my side table. Next week I will be sharing three ornament ideas on the blog and this photo transfer Christmas ornament on KUTV's Fresh Living! I hope you are having fun getting your home ready for the holidays. I'll be sharing lots of ideas and recipes this month so check back often! Happy Thanksgiving! I love this day....but this post is going to be short as I am booking to to get everything done. We have 15 coming for dinner tonight and there is a ton to do. Thank heavens for the schedule of preparation that we have been working on this week. It will make it pretty easy. The first thing I did this morning after drinking a big Diet Coke was to wash the turkey and get it in the oven. I boil the neck, heart, and gizzard to get broth for the stuffing...adding a little salt and fresh herbs. We rub the turkey down with butter and stuff it with the pre-chopped celery, onion and herbs from the day before. I follow the Reynolds instructions to get our perfect bird every time. While the turkey is baking we make the stuffing and peel the potatoes for my favorite mashed potatoes. For the stuffing I melt a cup of butter and saute rough chopped celery, onions, and fresh herbs until sweating. I add 3 - 5 Tablespoons of poultry seasoning to this mixture. Then I add the dried bread cubes and toss well. After it has been tossed I add the broth mixture from the turkey parts until it is the perfect moisture. Place the stuffing in a covered baking dish and top with pats of butter. Yes, I know it is a lot of butter...but it is Thanksgiving and stuffing! I bake it for 30 to 40 minuets and let it brown a little on the top. This stuffing has been served at our table for over 20 years and is the perfect compliment to everything else on the plate. While the stuffing is baking we peel the potatoes and get the mashing done. Lots of butter and sour cream go into my mashed potatoes. They are soooo yum! 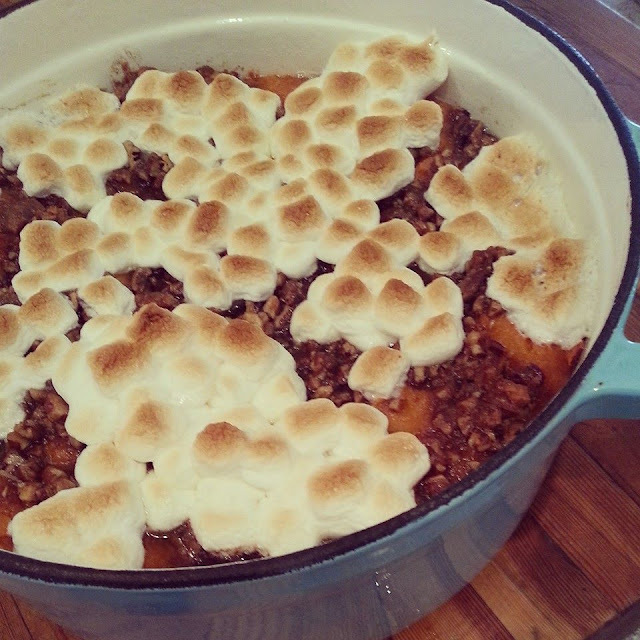 I heat the rolls, top the jello with whipped cream, get the punch ready, put everything in it's serving dish, make the gravy from the turkey drippings in the Reynolds oven bag and the last thing I do right before we eat is marshmallow the Sweet Potato Casserole and broil it until perfectly toasted. We had a wonderful Thanksgiving with our family and a few friends. I love this day even with all the work because there is nothing that I love more than my family and good food always brings them around. I hope you had a wonderful holiday too and felt the blessings of Him who gives all! Happy Thanksgiving. Today is my favorite day in the week of Thanksgiving prep. because it is pie day. I truly think National Pie Day should be changed to the Wednesday before Thanksgiving as I think there are are more pies baked that day than on any other! 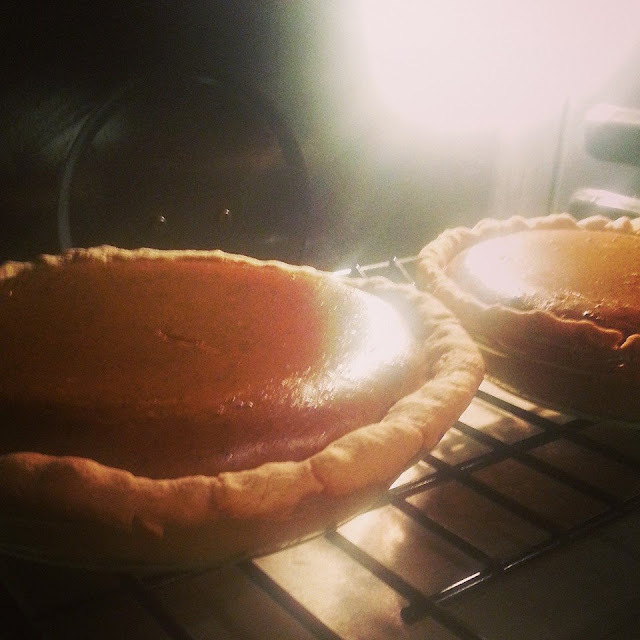 Everyone has their favorites, but I like to stick to the three traditional Thanksgiving Pies (of course with a little twist) pumpkin, apple, and pecan. One of the cutest little surprises on Thanksgiving Day are the little individual pumpkin pies baked in a mason jar lid. They are so easy to make and are the perfect little "snack" before the big meal. We always snack on pie before dinner...don't you? 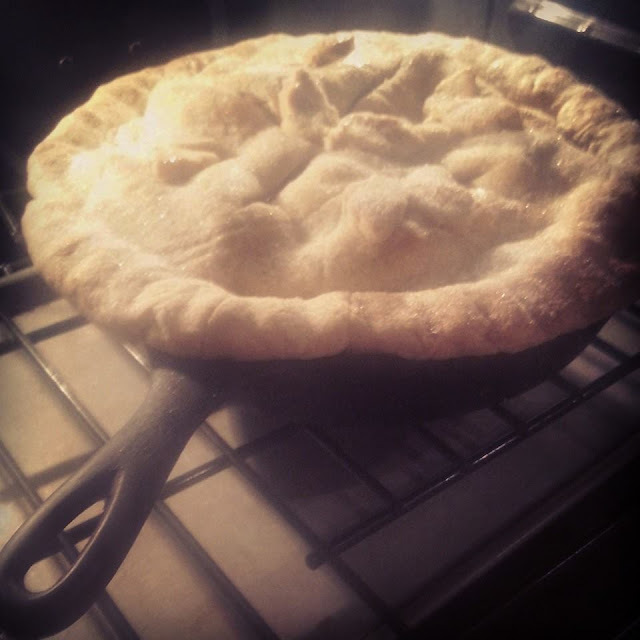 To make these pies you take your favorite dough recipe (mine is at the bottom of this post) and form it into the lid of a wide mouth sized mason jar or canning lid. Place the lids on a cookie sheet for stability. Fill to the level of the lid edge leaving your dough edge sticking above. Bake at 350 degrees for about 20 minuets or until the custard is set. Take out of oven and let cool. 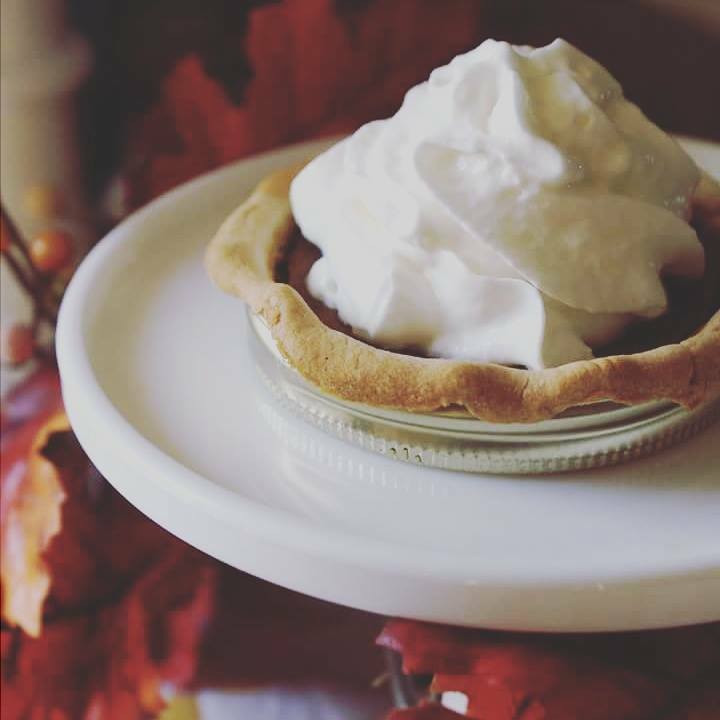 Top with fresh whipped cream and say yummmmmm! 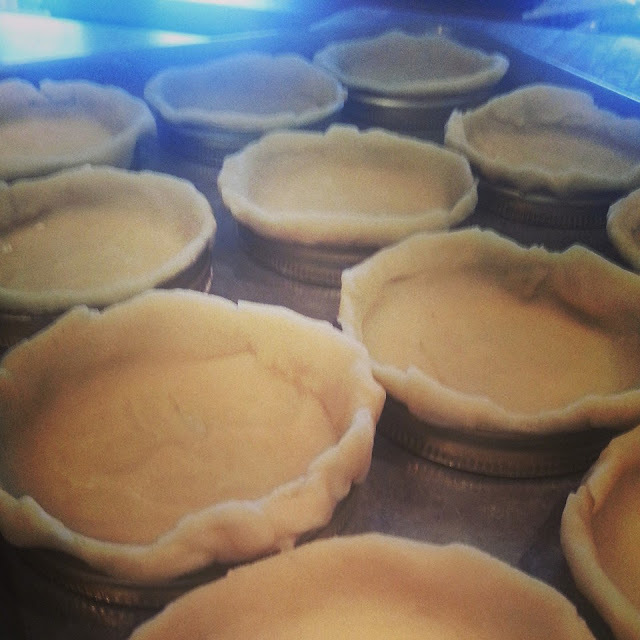 I try to get all the pies baked on Wednesday. While the pies are baking, I table set and a once over look at the centerpiece and clean the house! I set out the punch mixes and make sure I have something great for the overnight guests to eat the next morning. Usually it's muffins and fruit...a little something healthy before the feasting begins. I also rough chop the vegetables and herbs for the turkey and get the turkey all prepped. Some years we have brined it, but our favorite way to cook a turkey is in a Reynolds Oven Bag with fresh herbs, celery, and onion. It is the more moist turkey you will ever eat! Make sure you get a little rest today too! You will need your reserves for tomorrow! Using a food processor, mix together flour, salt, and sugar. Pulse in the butter until you get pea-sized crumbles. Mix the ice water with the apple cider vinegar. Sprinkle in a little of the ice water while mixing the crumbles in the processor until the water is incorporated and the dough forms a ball. If you have dry bits left you can add a touch more water until they form together and add them to the larger ball. Divide the dough in half and shape the dough into a flat disc. Wrap with plastic and refrigerate for at least an hour. Roll our with minimal flour or I love to roll out my pastry in parchment paper to avoid adding more flour to the dough. It also helps with lifting the dough into the pie pan. Enjoy! It's Tuesday or "Day Two" of our Thanksgiving dinner preparations, and so far it is going great. The goal here is to do whatever can be done to make Thursday a relaxing day. If your family is like mine, they start showing up at the house on Wednesday, so I am trying to get everything I can do today. 1. Wash and iron linens. 2. Make sure special dishes are ready. 3. Make sure your final grocery list is complete ( I will make a late night run to avoid the crowds). Peel and dice sweet potatoes into 2 inch chunks and place in a baking dish. Sprinkle with olive oil and sea salt. Bake at 350 degrees until the potatoes are fork tender. Bring out of the oven and place in a large mixer bowl. Add 1/4 cup of the butter, 1 cup of the brown sugar, 2 teaspoons of the cinnamon, vanilla and evaporated milk. Beat together mashing the potatoes and incorporating the ingredients together. I personally like to leave some chunks whole in the mix to add a little "bite" to the casserole. Spoon into a well buttered baking dish. To make the topping, mix together 1/4 cups of softened butter, chopped pecans, the rest of the sugar and cinnamon. Spread this mixture over the top of the mashed sweet potatoes. Cover the dish with a lid or tin foil until Thursday. When you are ready to bake the casserole, heat the oven to 350 degrees and bake for 25 to 30 minutes. Just before you take it out of the oven, sprinkle a couple of cups of mini-marshmallows over the dish and place under a low temp broiler to melt and slightly brown the mallows. It takes just a few minutes, so watch them closely. The other task for today is to chop the onions, carrots, celery, and herbs for the turkey and stuffing. I place them in separate containers and refrigerate until needed. I love doing this ahead of time because it saves time, and my boys don't get realize they are doing little bits of Thanksgiving Day dishes every day...instead of all at once. It's a "mom" mind game! My family's favorite appetizer on Thanksgiving is the Cranberry Cheese Ball. Again, it is super easy to make and tastes much better when it is made a few days ahead of time. In a mixer add all of the ingredients except for the chopped nuts. Using a cookie paddle, mix together the ingredients until everything is incorporated together. Using a spatula press the mixture into a ball....you may need to use your hands to form a good ball. For today, place the naked cheese ball in a bowl and cover with plastic wrap until Thursday. Before serving, pour the chopped walnuts into a medium size bowl and roll the ball in the nuts, pressing the nuts into the surface of the ball. Serve with crackers or crisp breads. If you are serving a jello salad, today would be a good day to make it and get it in the fridge....mine is in there chilling till the big day. Tomorrow is pie day!!!!! I have a few of my grown-up kids coming to help...and I can't wait to spend time with them. Get some sleep!